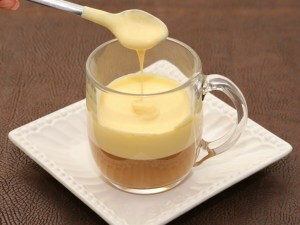 Sweet and velvety whipped egg yolks are layered on top of robust filtered coffee to make this delicious hot beverage. 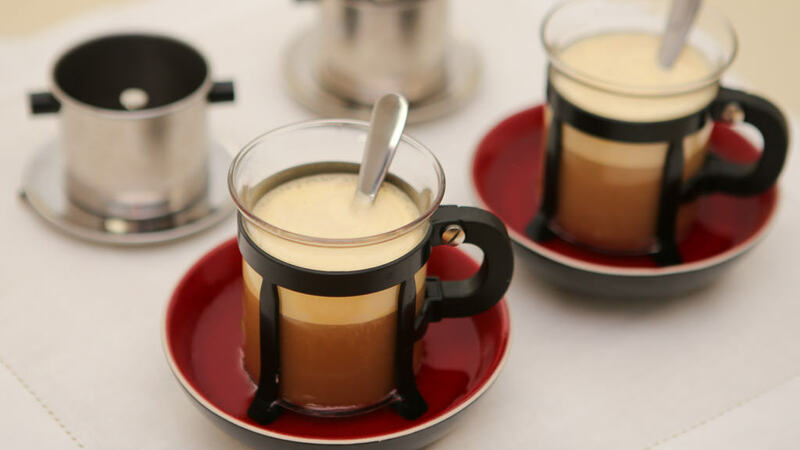 Vietnamese Egg Coffee is not as popular as Vietnamese Iced Coffee but it will be once the word gets out…So I hope this post entices you to give this amazing drink a try. If you enjoy coffee and dessert (and who doesn’t? ), you’ll love this beverage. The bitterness of the strong coffee is a tantalizing contrast to the sweet and fluffy whipped eggs. Especially now, during the colder months and holiday season, it’s a perfect indulgence to wow your tastebuds and warm your belly! Enjoy! I use pasteurized eggs instead of regular raw eggs for health reasons. You can purchase pasteurized eggs at your grocery store but the pasteurization process is really easy to do at home. Check out my video: How to Pasteurize Eggs for more information. Make sure the eggs are at room temperature before beating. They’ll be fluffier when not so cold. When separating the eggs, try to remove as much of the whites as possible as it will result in a smoother texture. I serve this often after a meal as dessert. It’s a wonderful coupling of a hot coffee drink and a sweet treat, perfect for finishing out a meal. Serve it with a shot of your favorite liqueur for even more flavor. I love Godiva Chocolate and Bailey’s Irish Cream. The whipped egg yolks do not hold up long, so enjoy right away. You can make ahead and refrigerate for up to 4 hours but consume it soon after as it will start to break down. If you’re in the mood to experiment, freeze the egg mixture and you’ll have a delicious tasting custard. Yum!! Pulse/grind the coffee beans for 15-20 seconds to achieve a Medium grind. Transfer the ground coffee into the coffee filters, dividing the coffee evenly. Shake the filters gently to level the coffee. Insert the filter screens and screw until snug. Do not over-tighten. Separate the eggs and place the yolks into a measuring cup. Add the vanilla sugar. Add 1 Tbsp sweetened condensed milk and then mix on High speed for another minute. To assemble the drinks, pour the coffee into 2 mugs, reserving 1 Tbsp coffee per mug. Spoon the fluffy egg mixture on top of the coffee, dividing it evenly between the 2 mugs. Drizzle the remaining coffee into each mug. Optionally, top the Vietnamese Egg Coffee with ground cinnamon or whipped cream or both.